If your company wants to be seen as a media outlet, your brand journalism can’t be light on ethics, riddled with errors, and sopping with self-interest that suffocates readers. 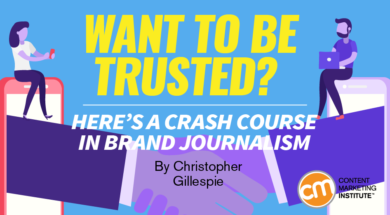 Here are four ways your team – like real journalists – can earn readers’ trust. Cite all your sources. Include a statistic in a blog article? Cite the source. Not including it suggests to readers that the author may have made it up. And if you find that one of those negatives applies, forgo using the statistic. Sources say a lot about your brand. Accurately linked, high-quality sources say, “We can be trusted.” Omitted or incomplete sources suggest a company agenda and an organization that can’t be bothered with facts. It takes only one lie or misstatement to break a reader’s trust. Because brands rarely get feedback from readers, they can spread misinformation for decades and not know it. Have you heard this statistic, “A 5% increase in retention can boost profits 75%” from Bain & Company. It’s been frequently quoted since the study was conducted … in 1990. The Soviet Union was still around then. Google wasn’t. It’s fair to say the world has changed. And the stat was bad when first cited in 1990. It’s based on a sample size of one – a credit card company that no longer exists. Cite a statistic like that to support an argument in an unrelated industry and you’re broadcasting, “We picked the first thing we saw on Google because it confirmed our pre-existing notion.” That’s not a good look for brands that want to be trusted. The difference between mainstream media publications and most business blogs is that the former openly strive for objectivity in their articles (and their points of view are reserved for their opinion pages). When newspapers have a conflict of interest, they state it. That may seem counterintuitive to the purpose of brand journalism, like ratting on yourself, but readers already know you’re biased in favor of your company. The only thing you can choose is how honest (or dishonest) you want to be seen. Just look at the bastion of journalism, The Washington Post. Though owned by Jeff Bezos, CEO of Amazon, the paper didn’t let that relationship stop it from running a story about how Amazon’s smart speaker Alexa eavesdrops on customers. The article’s author discloses the Amazon connection (as The Washington Post does with all articles mentioning the CEO or his portfolio). Most brands don’t have the stomach for that sort of transparency. But that transparency leads to trust. You have to be unafraid to tackle true, sometimes sensitive topics, in your industry even if they don’t directly serve your interests. For example, the analytics software startup Mixpanel admitted it had been pricing its product wrong. And the CEO of messaging platform Drift publicly admitted its marketing had lost its way. Rather than express outrage, readers of both blogs responded positively on social media and appreciated the honesty. The primary purpose of content is to interest readers. That can be difficult because we’re predisposed to believe that if we find something interesting, then everyone does. It’s known as projection bias. This thinking leads companies to write overtly self-promotional articles about things few people care about. Consumers ignore selfish drivel content like they do ads. Journalists, on the other hand, write with their reader in mind. They have no choice – their readers or viewers are the central cog of the business. They invest their time meeting the people and companies they report on and receiving torrents of critical feedback – something Abraham Lincoln called “public opinion baths.” And then, journalistic publications use editors to gut-check topics before they’re published for their audiences. You’re on the wrong track if you choose topics without consulting customers and decline topics that don’t expressly mention the brand’s products. This is a death knell for an audience-building content program. Can you spot which company blog gets it right? Kicking Off Our Bengaluru Office With A Bang! Both companies sell the same thing. But while the former drones on about itself, the latter focuses on what matters to its readers. The latter is a blog sponsored by the parent company that lets its brand journalists write about whatever pleases readers. Each month, around 13,000 people visit the first blog, according to SimilarWeb data, while 54,000 visit the second blog. I can’t speak to conversions, but one certainly has more traction and mindshare. Brands and bloggers now attempt to “hack” people’s attention by writing in abbreviated colloquial babble that’s riddled with clichés. These hacks sometimes attract attention, but attention isn’t the same as comprehension. Compare the breezy, web-friendly writing of a growth marketing agency (QuickSprout) to that of an analytics software firm (Mixpanel). Both seek to explain AI. QuickSprout may get your attention by talking like a chatty bus driver, but it conveys little, whereas Mixpanel conveys much more with the same word count. Mixpanel is both intriguing and information dense and improves the reader’s understanding of the topic. Its writer did the hard thing and actually invested in having real things to say. Brand journalism is a marathon and winners travel light. They name their sources, aspire to objectivity, think like readers, and write like adults. It’s a combination that creates a sense of trust between reader and writer, and the only way you’ll grow your brand in an age where trust most definitely still matters. Think like a journalist at Content Marketing World 2019 Sept. 3-6 in Cleveland, Ohio. Grab a reporter’s notebook, ask questions, and document what the hundreds of speakers have to say. And return to the office with a notebook full of helpful advice. Register today using code BLOG100 to save $100. Chris Gillespie is a writer and founder of content marketing agency Find A Way Media. After a career in sales, Chris realized he could help brands grow even faster by harnessing the atomic particle for communicating human experiences -- stories. Learn more about storytelling on The Beat, a publication about the pursuit of brand writing perfection. Follow Chris on Twitter @cgillespie317.